The historical marker on Bakalar Green honoring the service of the 2466th ARFTC Air Force Reserve Training Center and the 434th Troop Carrier Wing. The 2466th was assigned to United States Air Force Reserve Training Center Atterbury Air Force Base. 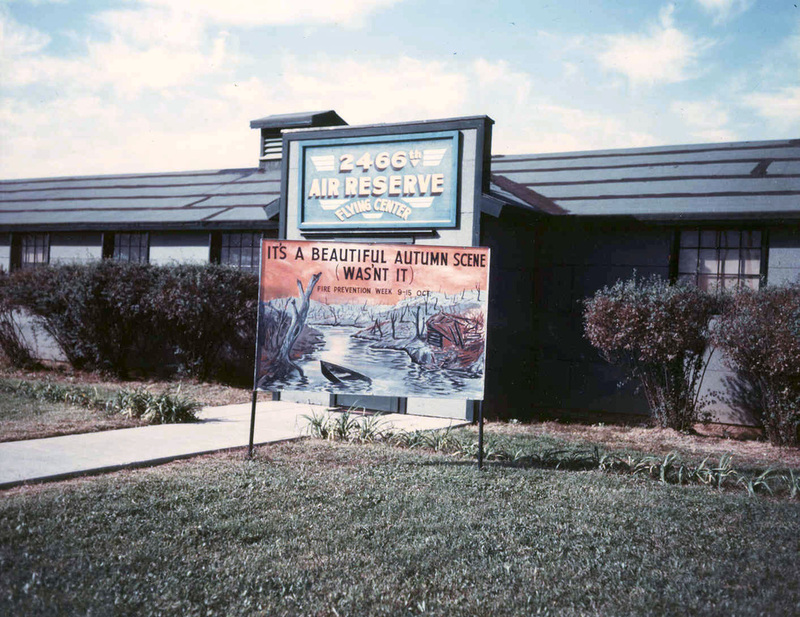 The Reserve bases were part of CONAC, Continental Air Command. Plans for immediate reactivation of Atterbury Air field at the north edge of Columbus were announced today by Major General Paul L. Williams, commanding general of the Tenth Air force, which has headquarters at Fort Benjamin Harrison, Indianapolis. Use of the 2,000 acre field, built during the war, will be a much larger operation than first planned, the field serving as summer training headquarters for two-week active duty tours of 5,00 to 10,00 Air Reservists from thirteen North Central states. Serving a dual purpose, the field also will become the center for third and fourth echelon maintenance of airplanes assigned to Tenth Air force headquarters at Fort Harrison, according to the announcement by General Williams. Lt. Col. H. H. Cloud, Jr., new commanding officer of the local field, announced that personnel will start moving into the base Monday. The initial permanent personnel at the base is expected to number approximately 200 enlisted men and officers. As organization progresses and the program is set up for summer reservists, the permanent personnel is expected to increase to around 400 enlisted men and 50 officers. The summer training program will run from July 1 through November 1 and it is expected that 700 to 800 reservist will be in training here for 2-week active duty tours throughout the 4-month period. The Tenth Air Force includes eight Troop Carrier Reserve wings and the planes to be used here in the summer training will be primarily C-46 and C-47 personnel and cargo transport ships. Transfer of plane maintenance of the Tenth Air Force headquarters to the local field will mean stationing around 33 ships here permanently, according to Colonel Cloud. These will be planes assigned directly to use of Tenth Air Force headquarters. During the summer training period approximately 100 other planes will use the local field. Colonel Cloud stated that only a limited number of civilian employees would be needed at the base, possibly 30 in the immediate future. It is expected that a large number of the base's permanent personnel will desire housing accommodations in or near Columbus and this was one of the topics discussed at a luncheon-meeting today of Mayor Robert L. Stevenson, Colonel Cloud, Capt. L. Y. Belote, who has been serving as commander at the local field, and City Attorney William A. Conner. Recreation and transportation facilities also were discussed at the informal meeting and tentative plans made for a second meeting to be held next week between city recreation and housing officials and Air Force representatives. Captain Belote, who has been commanding officer at the local field for some time, will remain as installations maintenance officer. 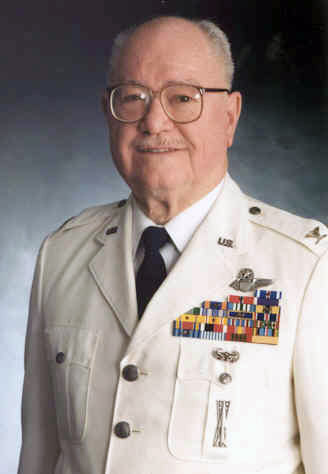 Colonel Herbert O. Hamilton former base commander. Master Sergeant Ralph Owens, a long-time base NCO and former base commander, Colonel Junius Dennison. 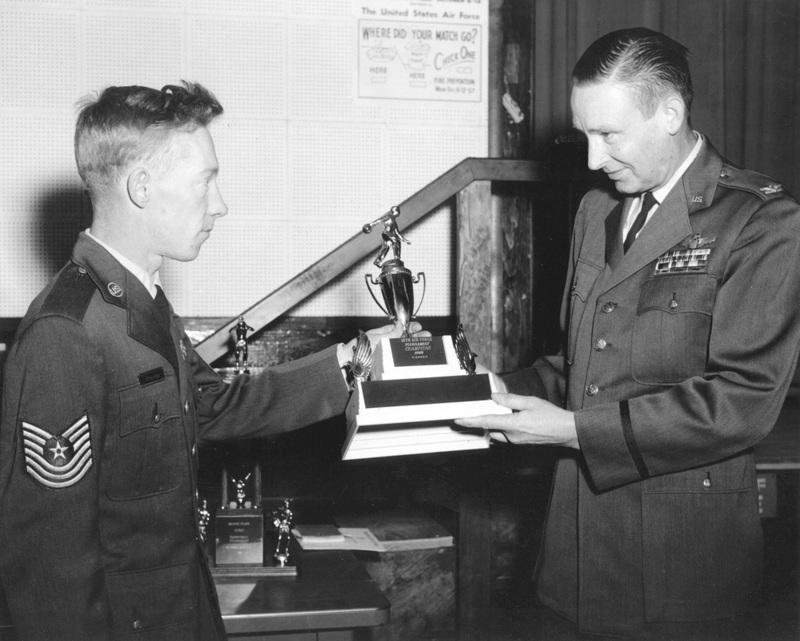 MSG Owens presented the 10th Air Force bowling championship trophy to Colonel Dennison in this 1958 official Air Force photo. 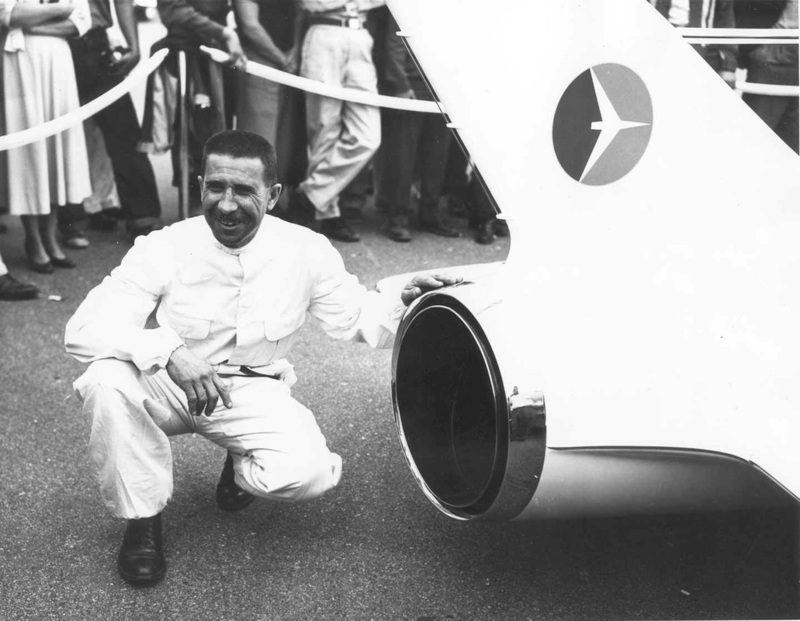 These photos were donated by Susan Warner-Conway daughter of Chester S. Adams, who was the Foreman of Aircraft Maintenance at Atterbury Air Force Base, then later known as Bakalar Air Force Base. Chester S. Adams is on the left in this photo. Adams is on the right in this photo. 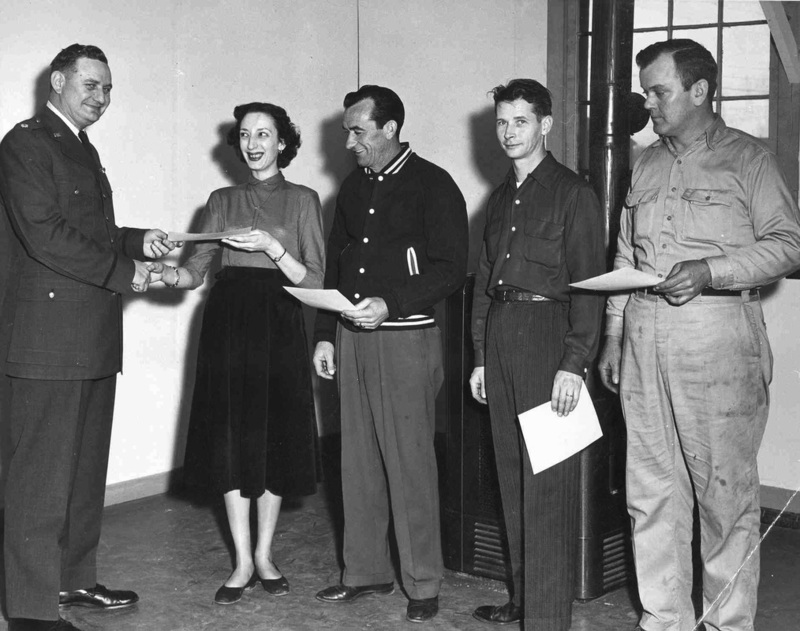 Major Arthur G. Beach Jr., Miss Margie Miller, Chester Adams, Oren Miller, and Ray Miller. 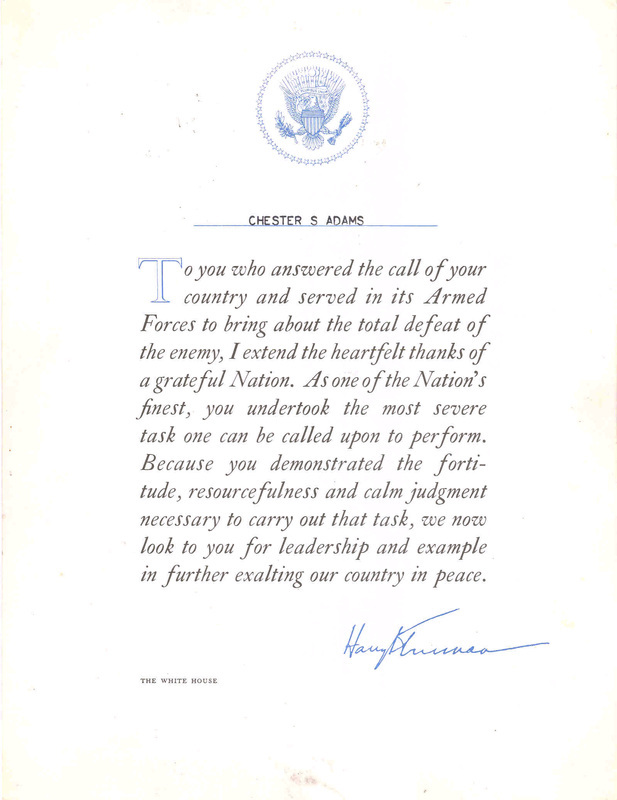 Also donated were some interesting certificates that were awarded to Chester S. Adams. The first certificate is signed by Hap Arnold. 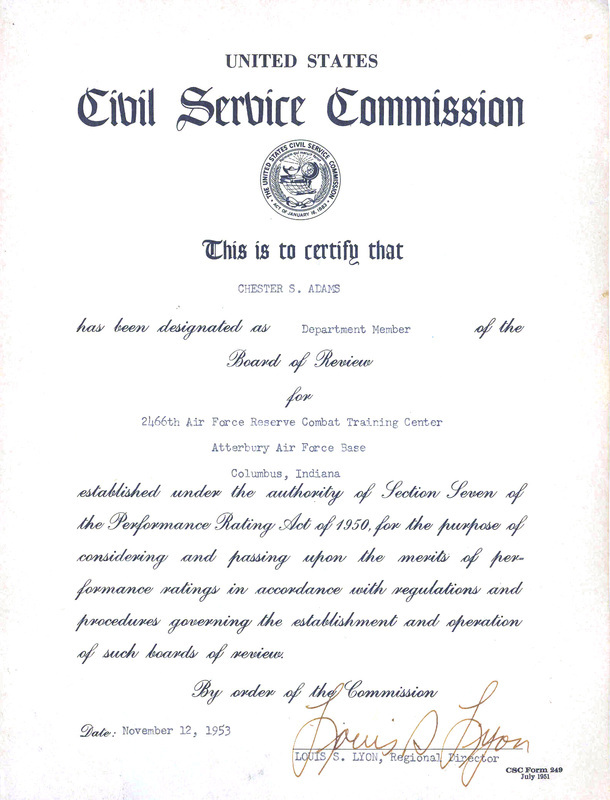 The Civil Service Commission certificate is for being designated as Department Member of the Board of Review for the 2466th Air Force Reserve Combat Training Center Atterbury Air Force Base. 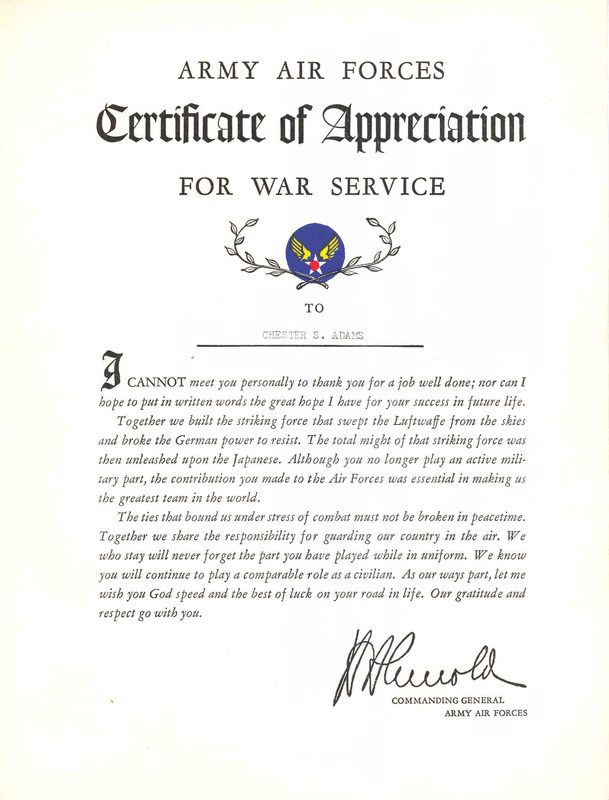 The third certificate is signed by President Harry S. Truman. 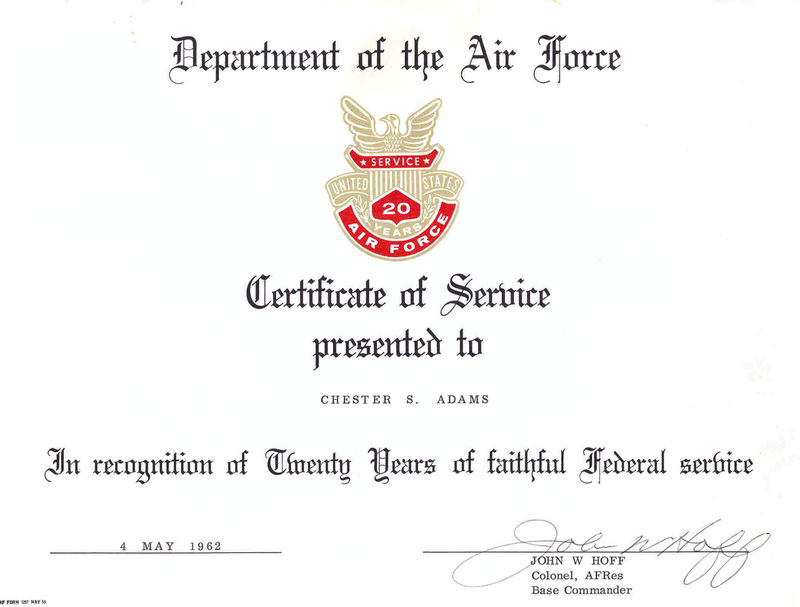 The next certificate for 20 years of Federal Service is signed by Museum Volunteer and former Bakalar Air Force Base Commander, John Hoff. 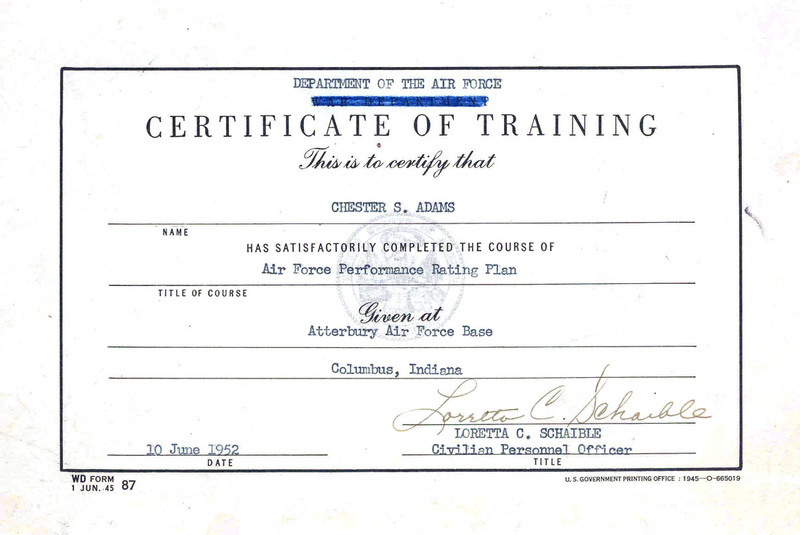 The last certificate is for an Air Force training course. These are very interesting historical documents of that time. 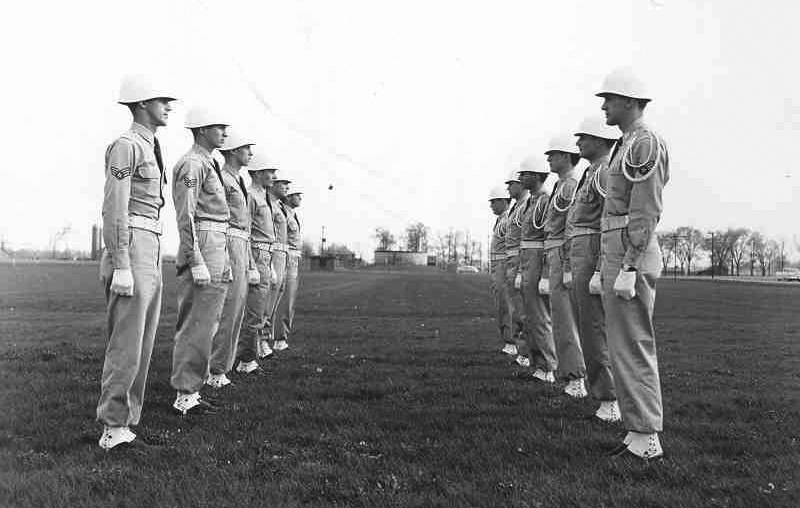 These Atterbury Air Force Base photos were taken in 1953 and 1954. 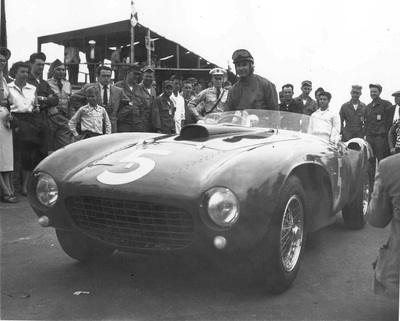 Both photos are from James Landrum's collection. 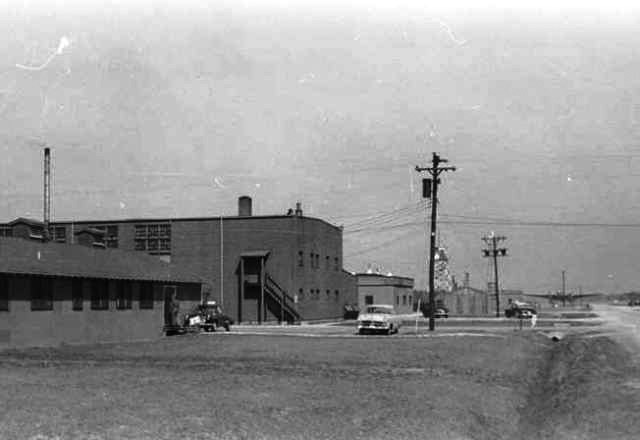 James was stationed at the former Air Base during this time. The helicopter was at the base during the sports car race and open house. James took this photo of the helicopter. 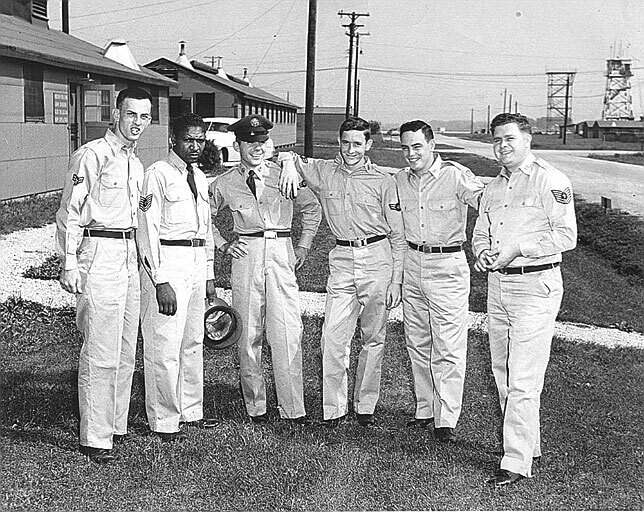 The Air Force 2466th personnel in the 1954 photograph are from left to right: Airman Fred Lee; SGT Scales, the base barber who lived in Seymour; the unknown airman third, in the photo, worked in finance; the fourth is James Landrum, Intelligence; fifth is Don Hudnut; and sixth unknown is Tech SGT and base photographer. In the photo on the right there is a tower next to the control tower. The metal tower next to the wooden control tower appears to be the new metal control tower construction. According to James Landrum, that tower was used as a fire tower and everyday at noon they tested the sirens for fire alerts. During 1954, the 434th transitioned from C-46s to C-119s. They had a PX coffee shop set up in one of the tents. 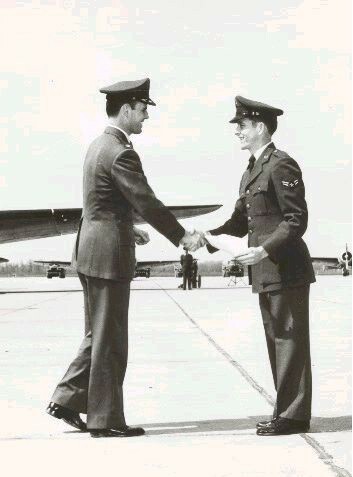 The photo was taken next to the Ground Training office, where Jim's Intelligence office had large wall maps, safe with secret and confidential documents, and where he administered GED tests to Officers and Airmen for College and High School diplomas. 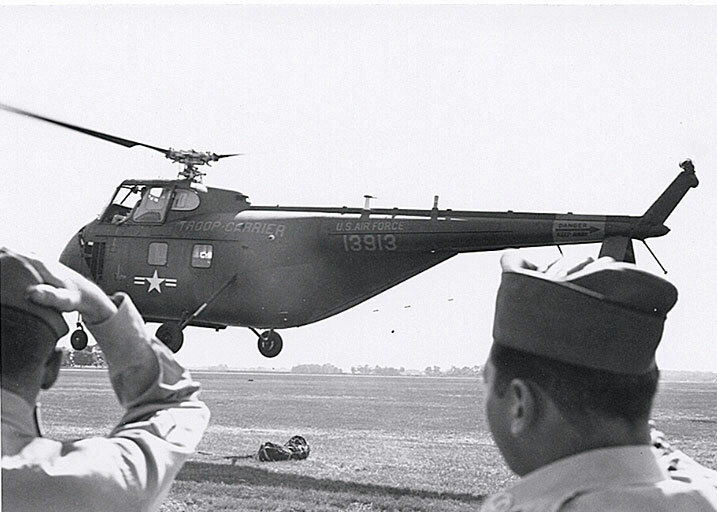 The 2466th was at the base from July 1947 to July 1959. According to the former base commander, Major General John Hoff, and Norman LaMaster, who served at the base during that time, there were forty eight C-46s, three C-45s and three C-47s stationed at the base during this period. 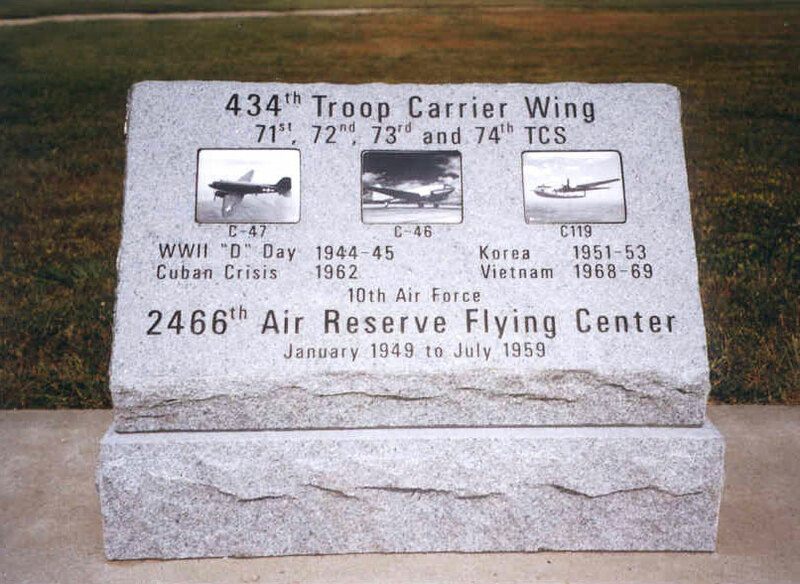 One of the C-47s was chosen to be placed on display at the front gate of the base where it remained for many years prior to the base closing. 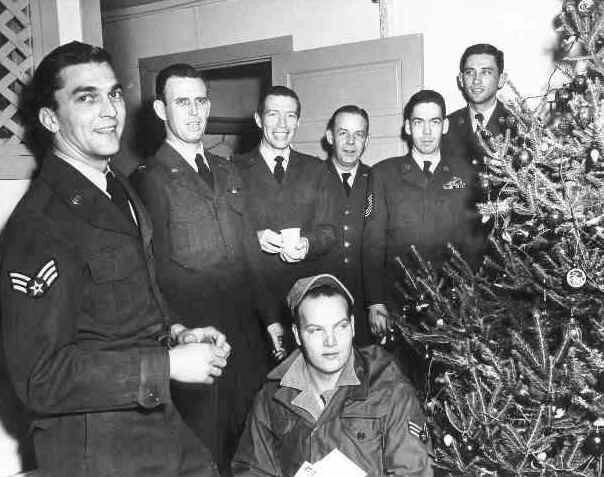 Atterbury Air Force Base Airmen gather around the Christmas Tree at the Headquarters Christmas Party December 23, 1953. Pictured: Sgt. Zondilak, Colonel Hamilton Major Tilman, Major Drane, Sgt. Gilsenan, Sgt Vandermay, and Sgt Whitehead kneeling in front. 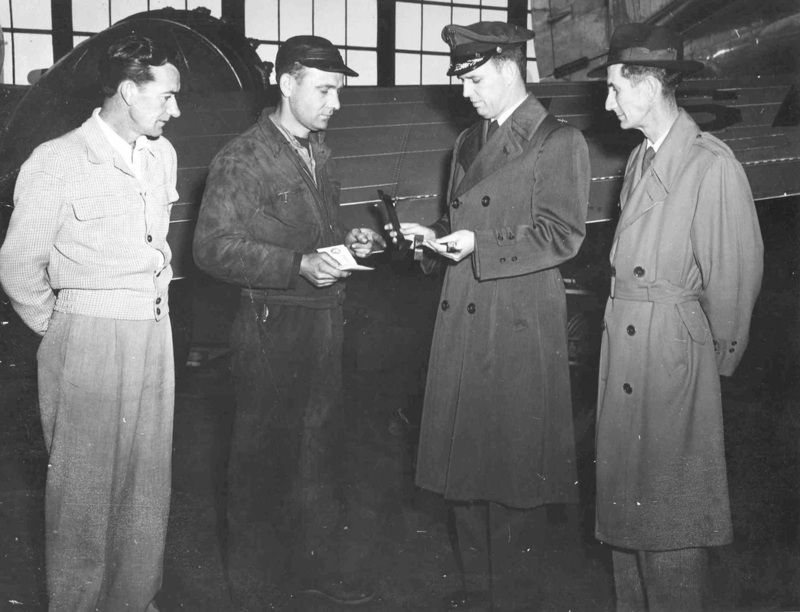 Thanks to the Alberta Abraham collection, we were able to identify the airmen. 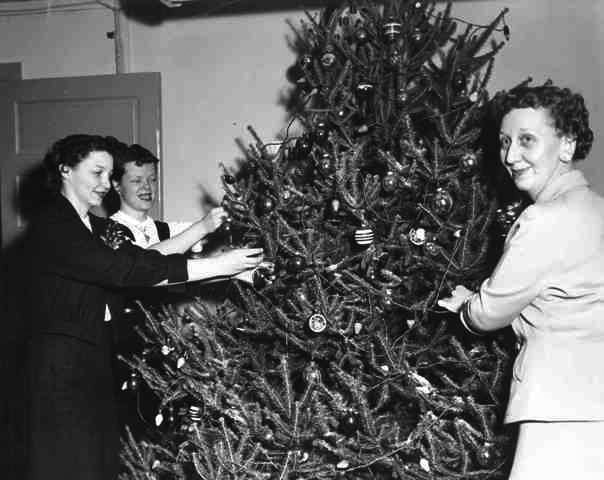 Photo two is Betty Pottorff, Joann Mitchell, and Alberta Abraham also December 23, 1953. Alberta was the base commander's secretary. 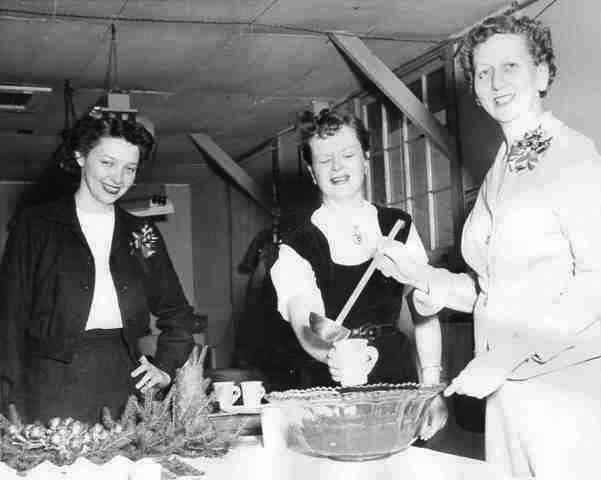 Betty, Joann and Alberta dipping into a little Christmas punch at the Atterbury Air Base Headquarters Christmas Party. 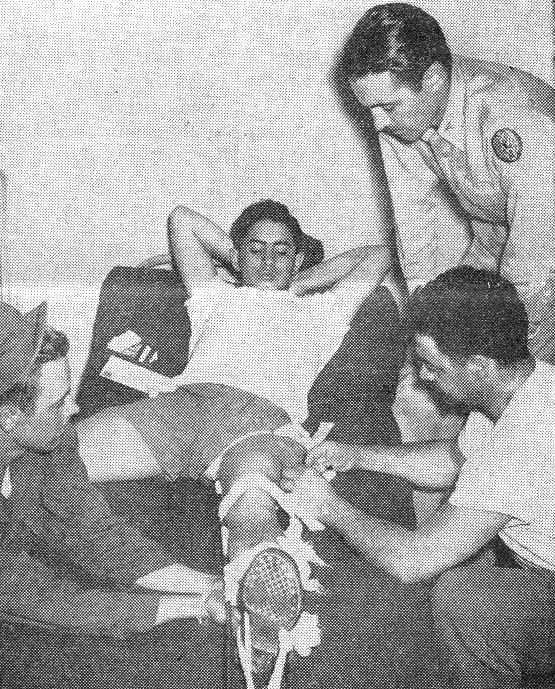 In the newspaper photographs below are part of a 10th Air Force unit of 250 men who moved into the Atterbury Army Air Base during May 1949 to begin reactivation of the air field for a four-month reserve training program. 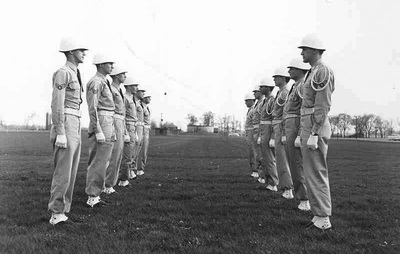 More than 6400 reserves from the 13-state 10th Air Force area would receive fifteen-day training periods from July 1 to November 1, 1949 according to the article in the Indianapolis Times. The first photograph is of Lt. 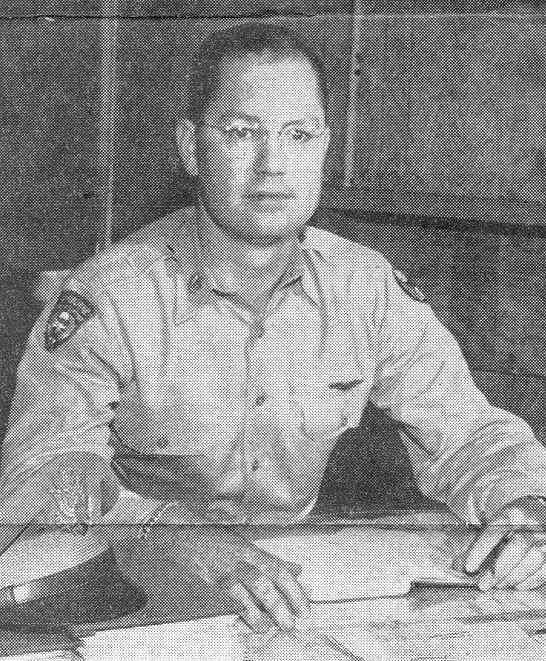 Colonel Howard H. Cloud Jr., who was the commander of the base. The second photo is of Colonel Cloud at retirement. The third photo is Lt. L. J. Schmidt, communications officer; S/Sgt. W. C. Michael and Sgt. 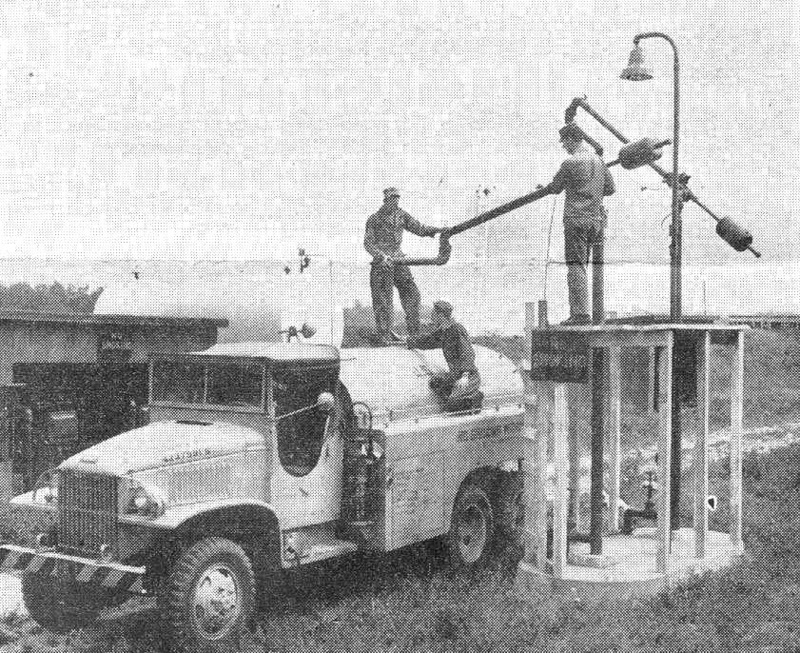 John R. Amos testing radio equipment at the air field that would link all 10th Air Force bases. The fourth photo is of Cpl. Ennis Bohannan, Capt. Walter Wellborn and S/Sgt. Bill Markie treating Pvt. Bill Lucerno for a leg injury. Sgt. Charles G. Gray, Cpl. 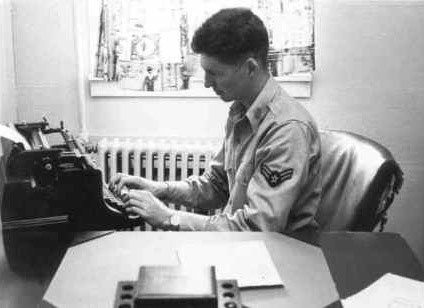 Clovis Murphy, and Pfc. Damon Hodges load a gasoline truck with 100-octane fuel. Officers expect to use 25,000 gallons a day in training. Each unit will bring 16 planes, mainly trainers and transports. 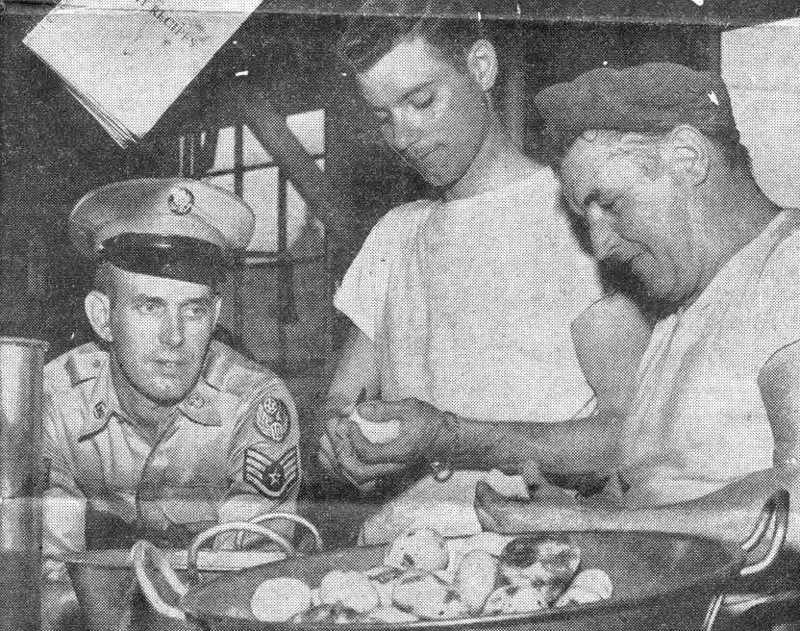 KP duty: Sgt Leland Swanson, mess hall supervisor, PFC Daniel Colanton, and S/Sgt Robert Irwin. 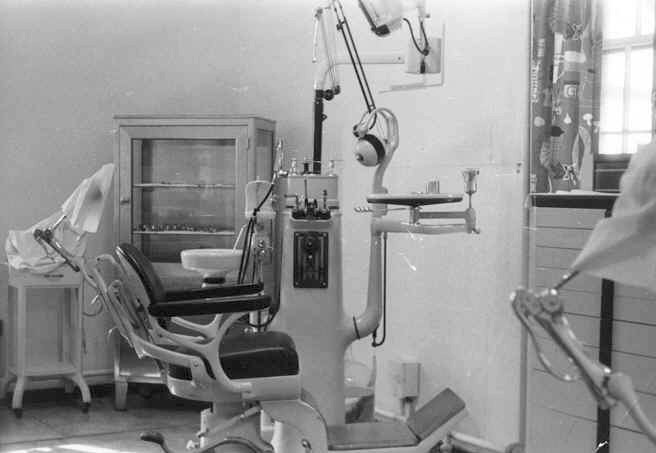 The first photograph is Ralph Howland at this typewriter in the base dental office in July 1953. In the second photograph from left to right are 1st Lt. Wesley A. Russell (Dr.), SSGT William Muth, and Ralph Howland having some fun in the base dental clinic August 1954. 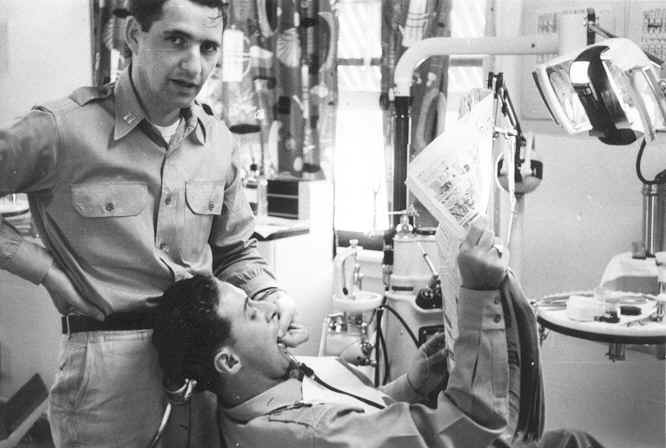 Lt. Russell replaced Captain Bengston as base dental officer. The dental department was in the same building as the infirmary. During this time, there an air force nurse and two doctors. The medical supply building was in a smaller building adjacent to the infirmary. The 1954 photograph on the right, donated by Ralph Howland, shows the Bakalar Air Force Base Color Guard. Ralph is second in on the left. We don't have the names of the remainder of the color guard. Building T124 Water, Potable, Storage Tank is shown in the background. Ralph was stationed at the former base during the mid 1950s and is a contributor to the museum web site. The base gym and the side of the base infirmary. You can see the control tower in the background. This area is now in the middle of Bakalar Green. If you stand near the rotating beacon on Bakalar Green today, it will place you near where the base gym and infirmary used to stand. 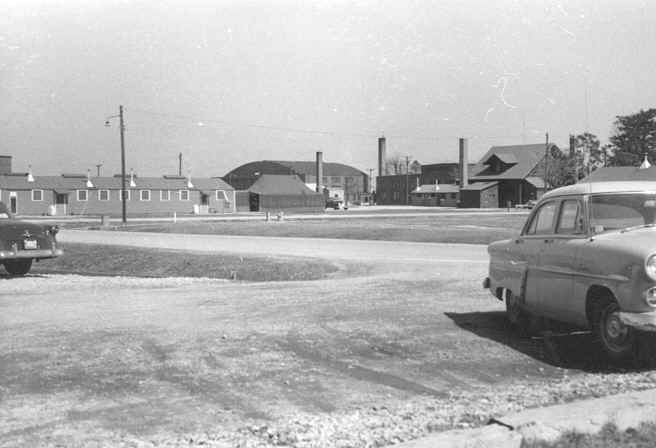 Did you notice the 1940s something Studebaker Coupe parked next the base infirmary? See if you can identify the other makes and years of the other cars in these photographs. 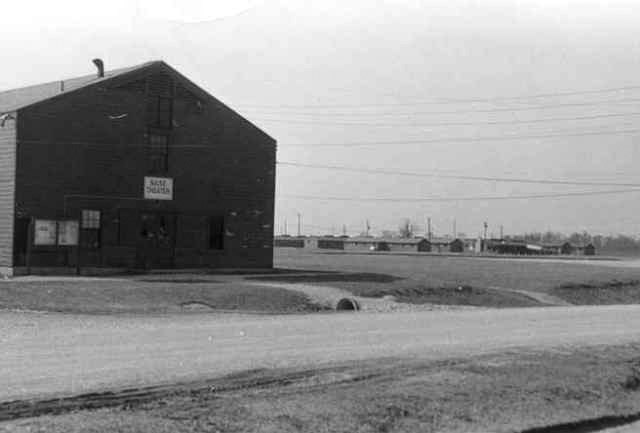 The base theater, taken from in front of the infirmary, 1953. 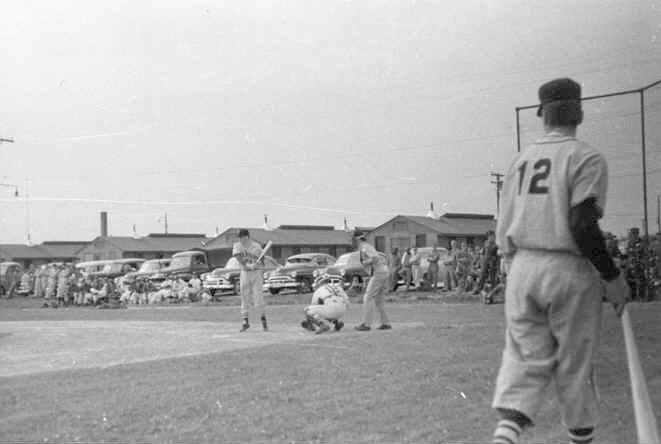 A summer of 1953 baseball game at the base. Warrant Officer Mastin and Lt. Stevens facing the camera, waiting on the road to the entry gate. 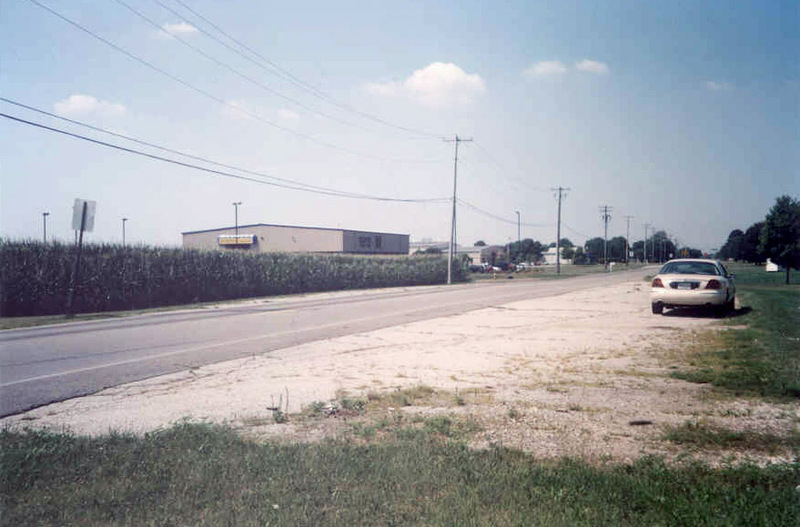 Today that location is on Middle Road near the airport boundary. Some of you may still remember the front gate house location. The photo below shows where the gate house used to sit. The base NCO Club and a hanger as seen from the base infirmary. The hanger still remains and is the Rhodes Hanger today. 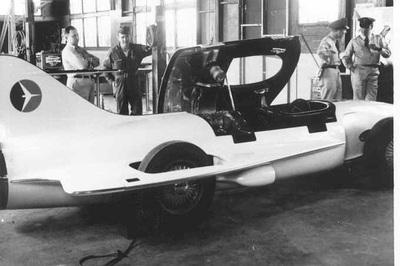 Airman Second Class George Feltz and Jerry Gilmore looking at their vehicle. These photographs were taken in March 1954. 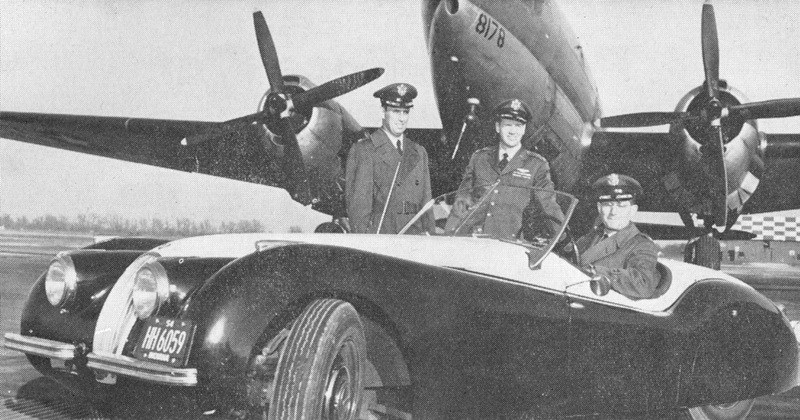 Captain Gordon Bengtson (Dr.) standing and Lt. Ludwig in the chair, in this May 1953 photo. 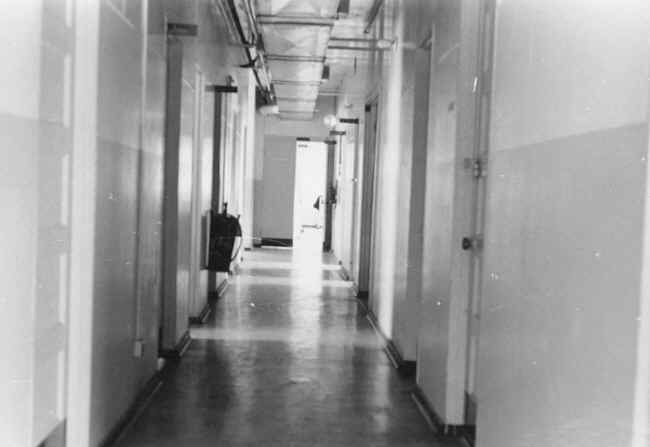 The hall of the base infirmary. 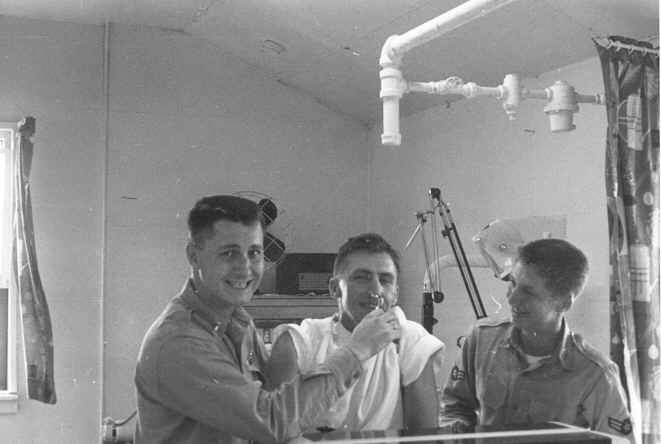 The base infirmary had a medical laboratory, x-ray lab, and small ward and pharmacy. "The Chair" at the base dental clinic. 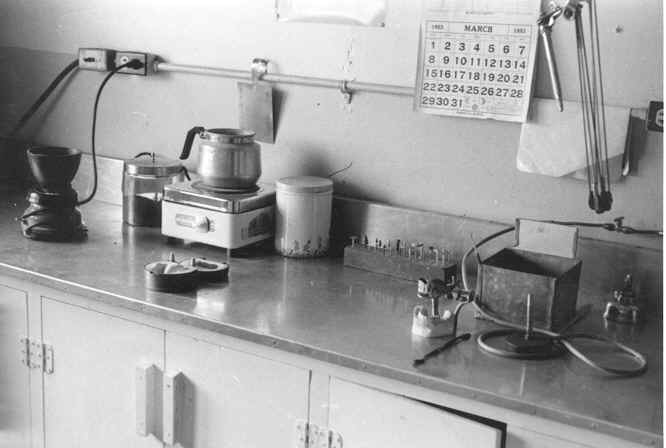 The "state of the art" dental lab - note the March 1953 calendar on the wall. 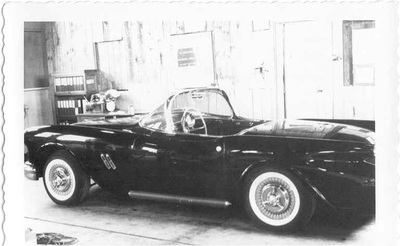 This photo is from the May 30, 1954 Hoosier Sports Car Classic Official Race Program. 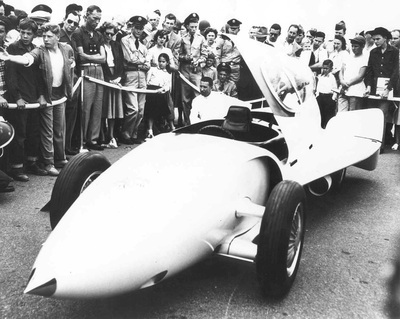 The race was hosted by the Atterbury Air Force Base, Columbus, Indiana, and jointly sponsored by the Columbus Indiana Junior Chamber of Commerce, the Sports Car Club of America, Indianapolis Region, and the 434th Hoosier Reserve Wing. From left to right in the photo are Colonel Hamilton, Colonel Bradshaw, and Colonel Schaeffer. Colonel Hamilton was the Base Commander at that time in history. 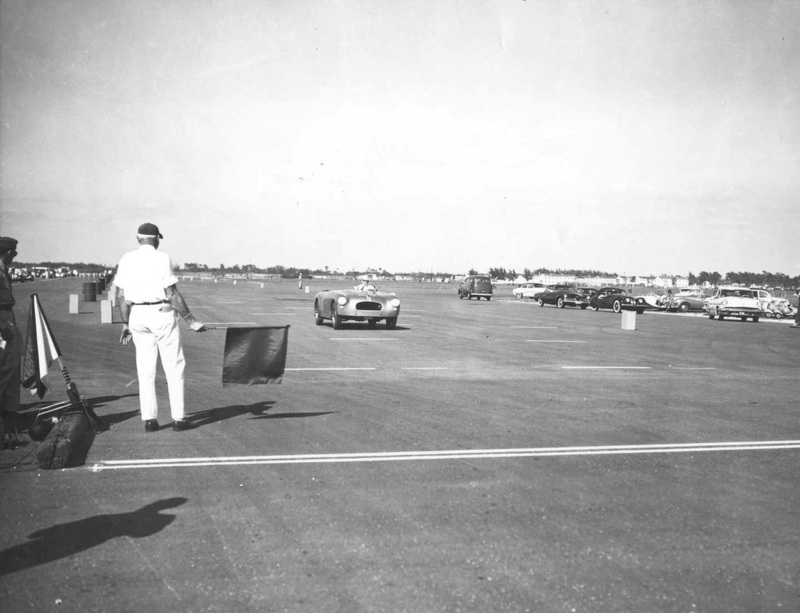 In 1954, Atterbury Army Air Base was part of the Continental Air Command. Colonel H. O. Hamilton presents James Landrum with a "Humanitarian Award" for Landrum's off duty service teaching at the Indiana Boy's School at Plainfield, Indiana. Landrum was honored in a Saturday parade by the entire 2466th. He was presented a certificate, given a cash award and leave time. Note the C-46s in the background of the photograph. 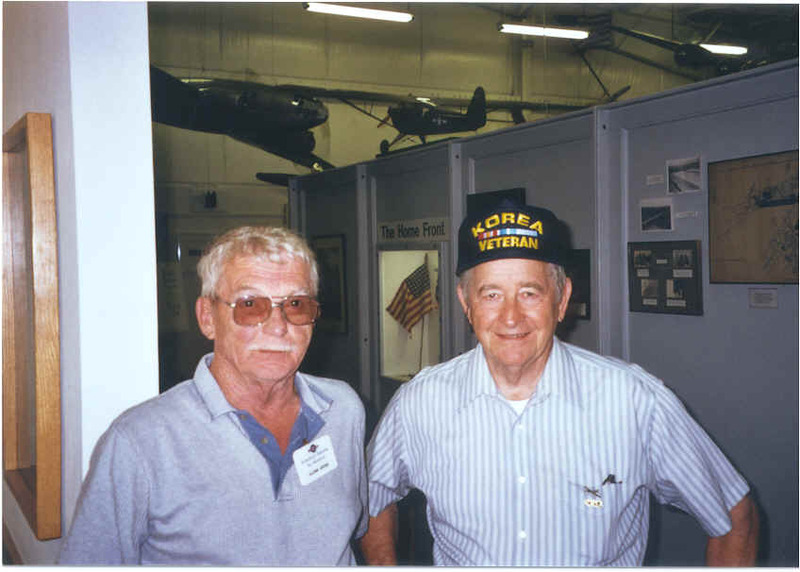 A current photograph of James Landrum with fellow 2466th airman and museum volunteer, Glenn Grube. James is a frequent contributor of historical photographs and information to the museum. James' humanitarian work continues today. 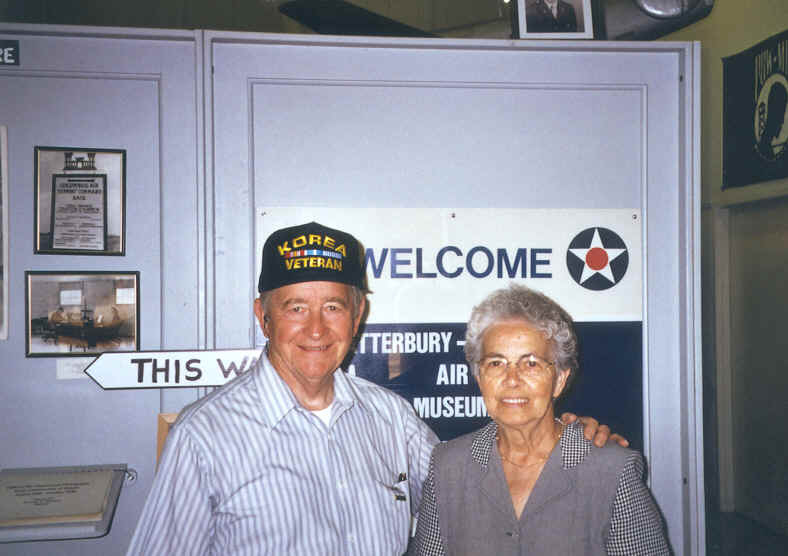 James and Betty Landrum visit the museum. An important part of the Ground Training program was the G.E.D. testing for Officers and Airmen. In addition to the Intelligence work for the base, Jim Landrum had the responsibility from the Base Command and the University of Wisconsin to do the G.E.D. testing for the 2466th. Landrum gave the tests to the men, sent the results to the University of Wisconsin, and the University did the grading. The results were sent back to Landrum. If they passed, Landrum then contacted the person's High School and obtained their High School Diploma. If an airman or officer took the two-year college test and passed, then Landrum had the authority to send the results to the college for credit. When James was stationed at the air base, one of James and Betty's twin daughters, Marrill Lou Landrum, passed away. Most of the Atterbury Air Force Base personnel made financial donations as an act of kindness for the Landrums. The museum has a copy of the list of signatures of over four double spaced pages of airbase personnel that made donations. The surviving twin daughter is Sherrill Sue. According to Ralph Howland, former airman at the base, "it was pretty good duty with a nice bunch of people and he really liked the area." The only downside of duty at a reserve training base for permanent party airmen was that these bases were usually small, which meant there was a lot of "detail" work such as KP, guard duty, and, during the summer months when the various reserve units came in for the annual two weeks active duty training, the permanent party people were expected to stay at the base, meaning no leaves. Walt Mitchell TSGT USAF (Ret.) was stationed at Atterbury Air Base during 1950 and 1951 in the 2466th AFRTC, when the 434th Troop Carrier Wing was called to active duty. 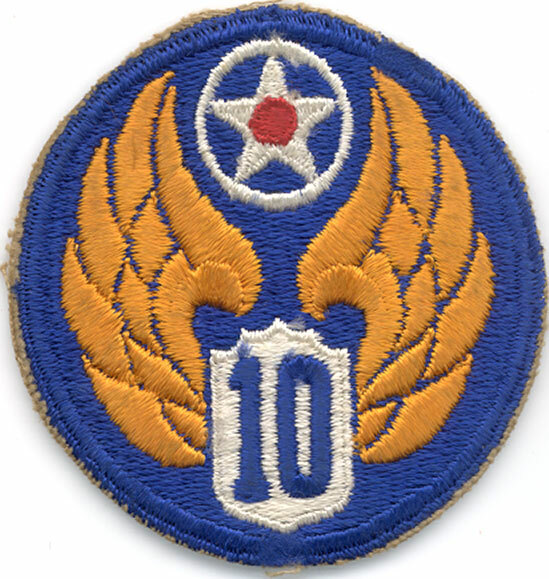 He worked in the clothing sales store as the Air Force was changing from the "Brown Shoe Air Force" to the current Blue uniform. Walt was quartered in a barracks just across the street from the NCO Club. When he was stationed at the base, there were three pot-bellied stoves in each barracks and the prized bunks, in the winter, were located near the stoves. The latrines (bathrooms) were located in separate building from the barracks. 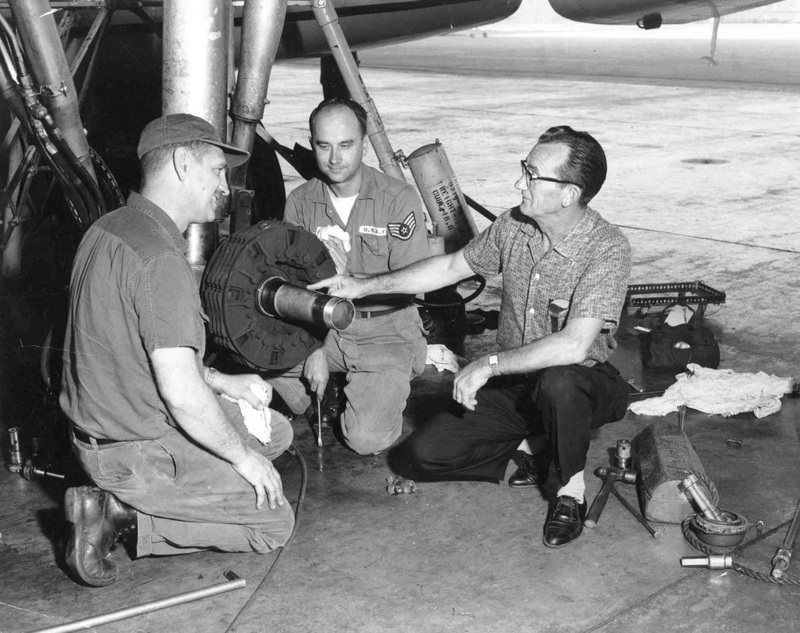 Stanley Heller was stationed at Atterbury Air Base/Bakalar Air Force Base from July 1953 to October 1955, serving as detachment clerk. Their detachment's responsibilities included staffing and running the base control tower, the message center, the crypto room, the GCA (Ground Control Approach), and Project Blue Book supervision and operation. Stanley applied for and received the proper security clearance and was Mr. Blue Book at the base. Stanley's detachment, along with the weather personnel, were officially assigned to MATS (Military Air Transport Service) and were detached to the base. Stanley remembers the base commander insisting they pull KP duty. 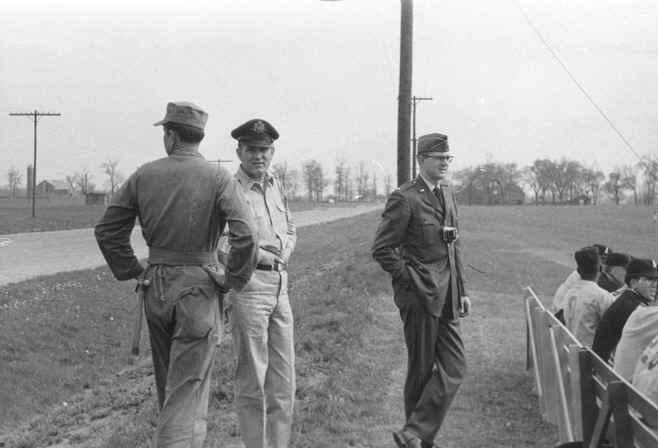 Since they never had that duty before, and their squadron at Wright Patterson insisted that they did not have any extra personnel, Stanley communicated with the base commander, a Colonel Hamilton, that they would be delighted to comply, however Colonel Hamilton had to tell them, in writing, which hours he would prefer to have the control tower out of operation. They never did pull KP. Thanks to these former base members for their personal reflections. 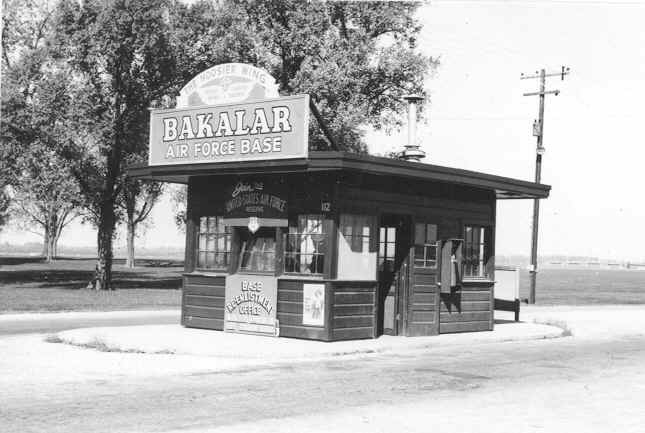 Were you with the 2466th at Atterbury Air Force Base/Bakalar Air Force base, or were attached, and have stories or photographs you would like to share with the museum?